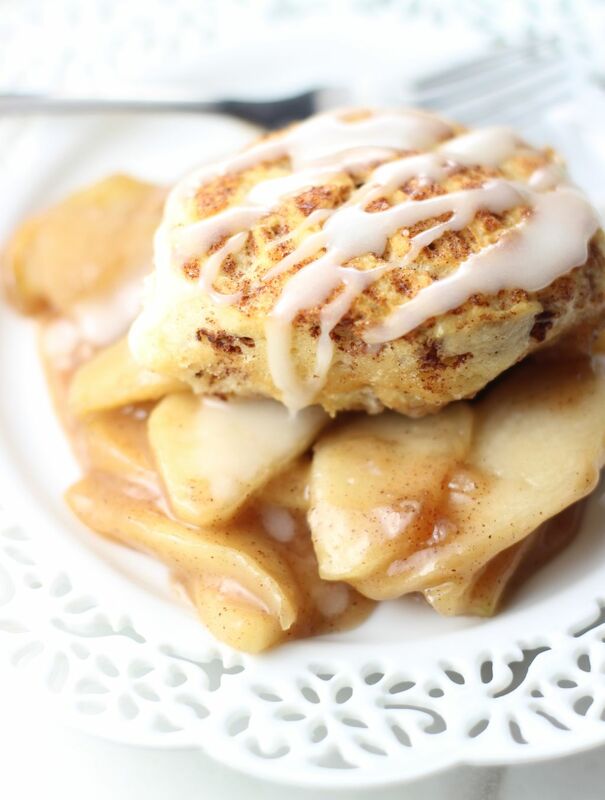 Gooey and sweet, from-scratch apple pie filling topped with glazed cinnamon rolls for a fun twist on traditional cobbler! 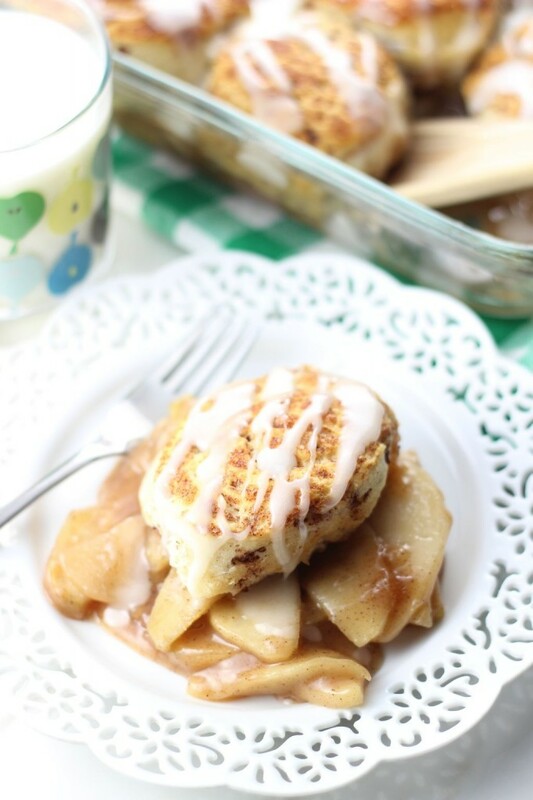 This Apple Pie Cinnamon Roll Cobbler will be your new favorite apple dessert, and it’s so easy to whip up! It is almost time. As much as I feel ready for fall, I don’t feel ready to post pumpkin recipes yet. I don’t know why. I’ve been shopping online for fall booties for about a month, and I finally found a few light jackets that will get a lot of use, and I’ve burned through three pumpkin/fall candles already, but I just can’t seem to pull the trigger on posting pumpkin recipes. Maybe when September arrives? I actually have 4 or 5 of them all set and ready to go – baking and eating pumpkin things has been no problem for me! We’re almost there though. In the meantime, we’ll turn to another fall favorite… one that I totally neglected last year: apples. I have a BUNCH of great apple things coming up, and I’m excited to share them. My planning (or lack thereof) last year was very lopsided. It was all things pumpkin, all the time. Though, nobody complained. 🙂 I think I had one recipe with apples, this Apple & Tart Cherry Crisp, through the entirety of the season. This year, I’ve stepped up my apple game, and my recipe planning was a little more balanced! 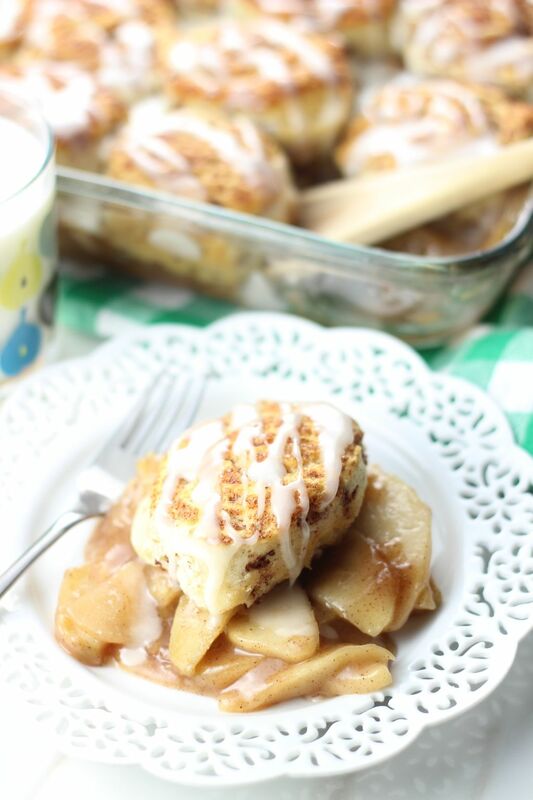 I am kicking off fall baking with one of my favorites first: this Apple Pie Cinnamon Roll Cobbler. I am so proud of this one. It’s killer. 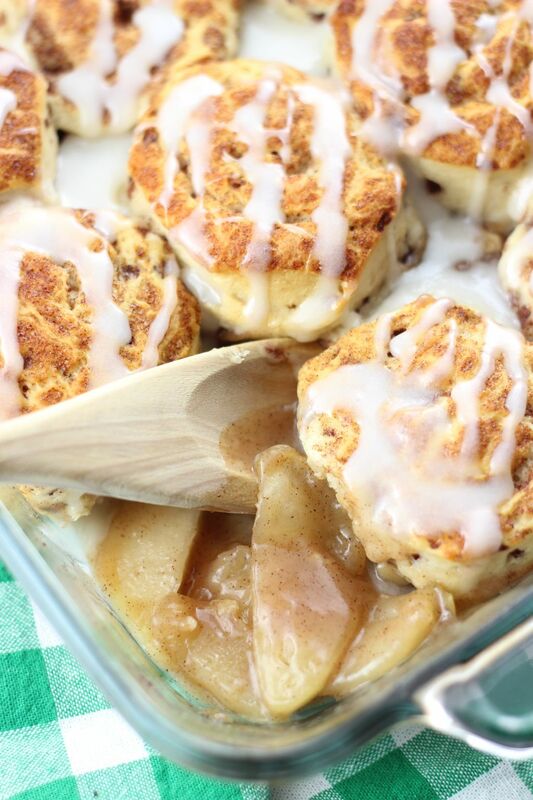 It’s homemade apple pie filling topped with cinnamon rolls… sooooooo, you know, Apple Pie Cinnamon Roll Cobbler. Forget batter or biscuits as your topping. Snooze fest. Cinnamon Rolls bring traditional cobbler back to life. You can make the dough from scratch if you’d like, and I’d check out these posts for my favorite from-scratch cinnamon rolls: these Cranberry Orange Walnut Sweet Rolls (for yeast-based option), or these Fig & Walnut Orange Cinnamon Rolls or Maple Bacon Pecan Cinnamon Rolls (no-yeast, no-rise dough option!). However, we are making the apple pie filling from scratch, so if you want to cut corners, just get the canned cinnamon rolls. You and I both know they are fabulous. No judgment zone here for taking shortcuts. 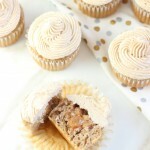 I’ve confessed my love for canned cinnamon rolls in the past, and nothing about that has changed! 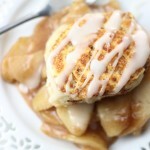 It’s not like most apple pie fillings where you just toss sliced apples with cinnamon and sugar. No. We cook a thick and gooey cinnamon-sugar syrup – an amazing sweet, cinnamon-y, and thick syrup! – that we toss the apples together with. It’s a quick and easy syrup (I promise), and something that you end up wanting to eat all on its own. 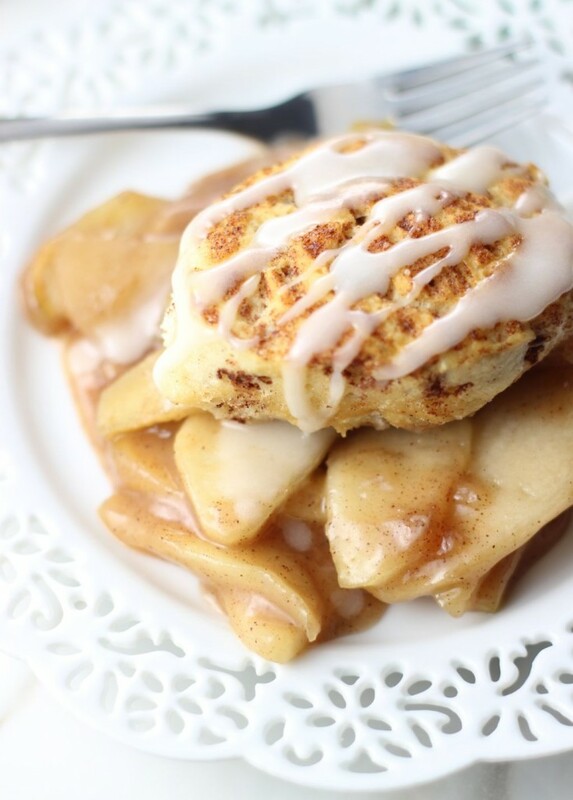 But don’t, we need it for this Apple Pie Cinnamon Roll Cobbler. With the *best* apple pie filling out there, and glazed cinnamon rolls on top, this Apple Pie Cinnamon Roll Cobbler is an unforgettable dessert that you must try! 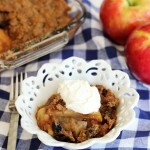 And for other fabulous apple desserts, do not miss the recipe for this Fireball Apple Crisp. Fireball makes that dessert something truly spectacular! 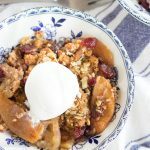 This Gingersnap Cranberry Apple Crisp is totally delightful, and the crisp on top is made with gingersnap crumbs. So, so good. 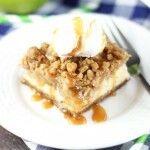 Lastly, if you’re an apple crisp fan, you *have* to try this Caramel Apple Crisp Cheesecake. There is nothing like baking an apple crisp on top of a cheesecake. Omg, it is to-die-for. 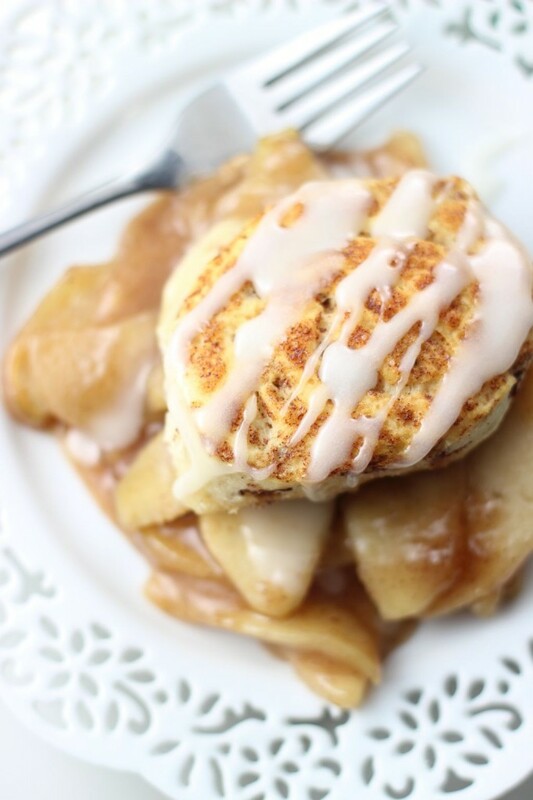 Gooey and sweet, from-scratch apple pie filling topped with glazed cinnamon rolls for a fun twist on traditional cobbler! 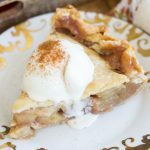 This Apple Pie Cinnamon Roll Cobbler will be your new favorite apple dessert, and it's so easy to whip up! 12 unbaked cinnamon rolls with glaze 2 cans of 8, you'll have 4 leftover unless you cram! 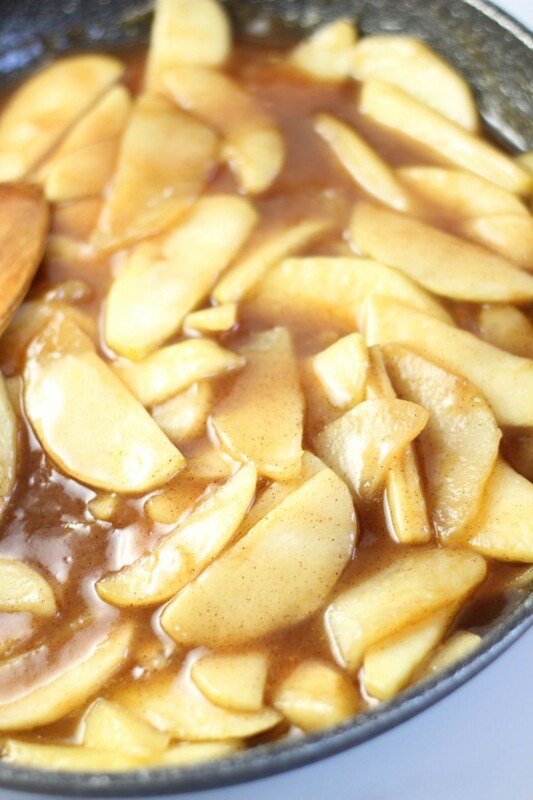 In a large saucepan over medium heat, combine the apples, brown sugar, and butter. Cook for 5-6 minutes, or until apples begin to soften and to lightly brown. We are partially cooking and caramelizing them. Reduce heat to low, and add the sugar, water, flour, cinnamon, and apple cider vinegar. Stirring frequently, cook until the mixture is thick, bubbly, and syrupy, about 3-4 minutes. Pour the apple mixture into a lightly greased 8x11 glass baking dish. Arrange the unbaked cinnamon rolls over the apple filling. No need to leave much space between them. Bake at 375 degrees for 15-18 minutes, or until the cinnamon rolls are golden brown on top, and the apple filling is bubbly. Drizzle the cinnamon roll glaze over the top. Inspired by Taste of Home. I agree! I’m so ready for fall baking!! I’m so excited about the season! Love this combo, I’ve had an apple pie cinnamon bun of some sort on my list for ages! This is the year, it’s gonna get made! Thank you so much, Cathy!! I’m not ready for pumpkin either but I am ready for apple season AND this cobbler! Lol! I am ready for apples too, but I wasn’t quite ready for pumpkin yet, even though I’m super excited for it. Now that it’s September 1st though, I think I’m going all in. Thanks, Nancy! I am loving this! I love the addition of the cinnamon roll, it really makes it WOW. 🙂 I look forward to giving this recipe a whirl. Pinned! This is the best of everything rolled into one. YUM!!! Sarah this is looking delicious! I’ll be featuring your recipe on the blog tomorrow… THANK YOU SO MUCH for partying with us! Stopping by from the SITS Saturday Sharefest… and lady, these look G-O-O-D. Like you, I feel weird about sharing pumpkin things just yet, but man, I can eat apple stuff all the darn time. Including this sweet treat. I’ve already pinned this and will absolutely be making it for us this fall! Yay! So happy you like it! I am finally ready for sharing pumpkin things, but I just can’t bring myself to make a pumpkin pie yet… that’s just TOO holiday-ish, right? Thanks, Erin! It really is just too holiday-ish! I’ve made some things with pumpkin, too, but I’ve yet to post anything because it’s still waaaaaaaaaaay too hot here to be sharing pumpkin goodies, even if it’s starting to feel like fall other places. These look amazing! You always make the most delicious looking treats! I served this for dessert yesterday. It was absolutely delicious. I love apple pie-y things and love cobblers so this was all for me. Easy recipe and oh-so-good!